The Fiamma Turbo-Vent is a tried and tested favourite of thousands of caravan and motorhome owners. 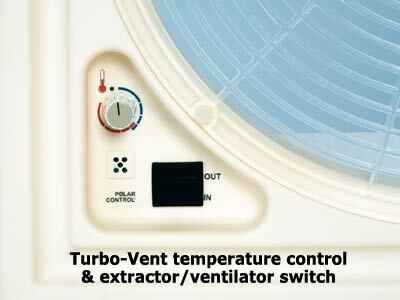 Turbo-Vent is a highly efficient 12V air ventilation and extractor system thats made from high quality materials that are shock and UV ray-resistant. It is capable of exchanging and refreshing the air inside your vehicle within seconds, thanks to the 12V DC variable speed motor with 10 blades. It is the only one of its kind fitted with an innovative electronic circuit that allows a rapid, problem free, change in direction of rotation using the integrated switch. 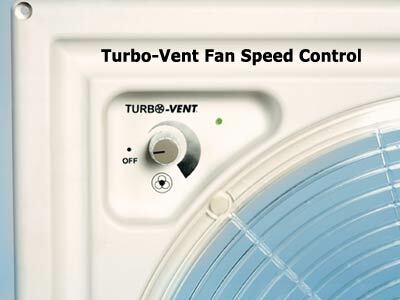 Turbo-Vent is silent at high speed and exceptionally silent at minimum speeds, which means you can use it at night and still get a good nights rest. The Polar Control allows you to save 50% electricity compared with other brands, thanks to a new efficient electronic circuit. The Polar Control system is the thermostat that regulates the incoming and outgoing air of the fan according to the inside temperature of the motorhome. It allows you to set the thermostat so the fan activates when required, even while you're away from the motor caravan. 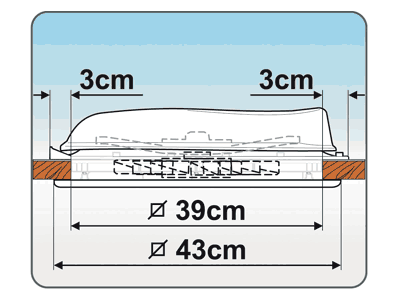 The cover is opened and closed by manual operation with a central arm that provides stability against high winds while travelling with the cover open. Provided with double external mosquito screen to stop leaves and other debris from damaging the fan or entering the motorhome. 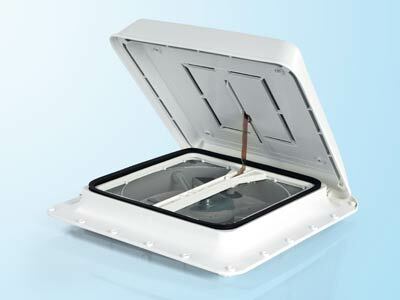 Offers permanent ventilation even when closed. 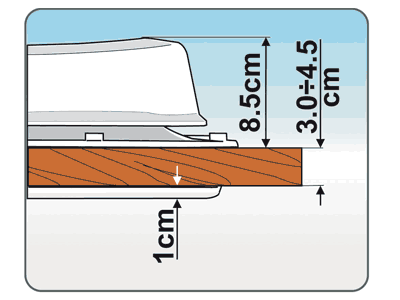 Can be installed on roofs with depths of 3cm to 8.5cm using an optional extension kit, suitable for installation to roof openings of 39 cm to 40 cm squared. Available with Crystal or White external cover. The White cover blocks out sunlight. The Crystal cover is not transparent. However unlike the White cover, the Crystal top allows light to pass into the motorhome. Install to roof aperture: 39cm. Min. - Max. current: 0.3 - 3amp. Maximum air flow: 35 cubic metres per minute. Functions: Works as a ventilator and extractor.